Formel Industries, founded in 1946, is a printer-converter of flexible packaging. We are committed to continuous improvement in our operations in order to better serve our current customers and to also obtain new customers. We pride ourselves on our ability to adapt and provide improved and unique services for our customers. In the course of these activities, we pledge to produce our products in a safe and consistent manner. 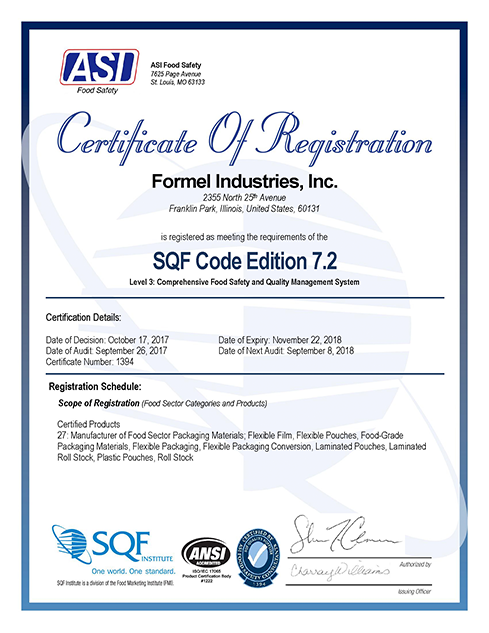 In order to do this, we have implemented a quality system based on the principles of Hazard Analysis Critical Control Point (HACCP) as codified by Codex Alimentarius. Our employees, from ownership to line employees, are involved in our quality process. All of our employees are trained in the company’s quality policy. We understand our commitment to growth and continuous improvement and how our quality system contributes to it. Our employees are our most valuable asset and the company encourages them to contribute ideas and concepts which can improve efficiency, yield, and quality. As part of our effort to ensure the highest quality possible, the company has established teams to ensure that levels of food safety and security are secure. Those teams are provided all necessary training to both maintain current levels of food safety and security and to facilitate continuous improvement in those areas by creating or adopting systems which can be beneficial to the company’s core business. We have achieved success through our emphasis on quality. We anticipate that future success will come through continued emphasis and improvement.